A fun day in an eco-park set up in a historic plantation: we visit a museum illustrating its history, climb to the top of a mountain on a spectacular cable car and experience the thrill of the longest zipline in the world. We board a fully air-conditioned bus and reach Rockland Estate, an eco-park that features adrenaline-filled surprises and breath-taking views. It is located inside the historic Emilio Wilson Estate. Our first stop is the house at the centre of the plantation, built in the 18th century and now home to the Emilio Wilson Museum: we learn about the fascinating history of Trace Wilson, an ancestor of Emilio born a slave in 1818 precisely in the plantation her descendant was to buy years later, generously contributing to life on the island. 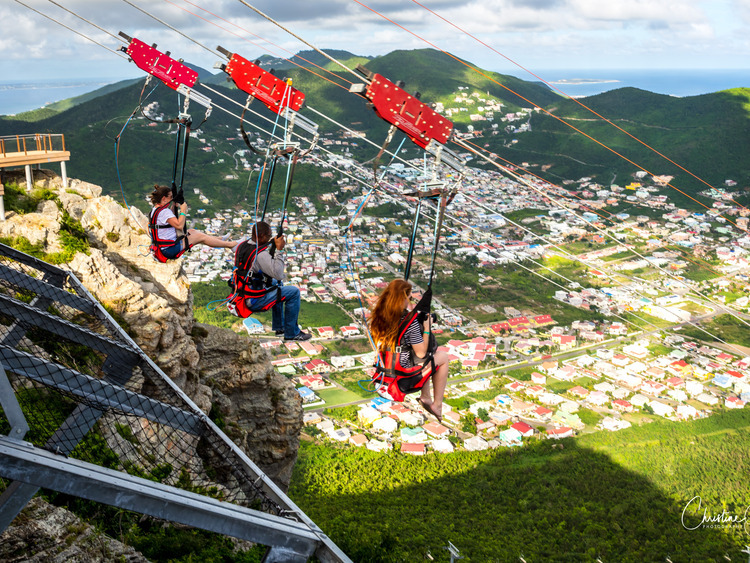 After this journey into history, we get ready to tackle other challenges: we get on the Soualiga Sky Explorer, a spectacular cable car suspended over the forest that, in approximately 25 minutes, takes us to the top of Sentry Hill, one of the highest peaks on the island. A series of platforms perched on the rock offers spectacular 360° views over the surrounding landscape: our gaze stretches over the mountains covered in thick forest and the glistening sea in the distance as far as the nearby islands of St. Barts and Anguilla. An even more adrenaline-filled experience takes us back to the valley: an incredible descent along the longest zipline in the world, The Flying Dutchman. Safely secured to our seat, we glide down the mountain and feel as if we are flying while picture-perfect panoramas unfold below us. After this adventure, we relax in the park: we can take a walk to discover the surroundings or enjoy the local specialities, snacks and drinks served at the restaurant. When the time has come to go back to the port, we bid farewell to this amazing location certain of having experienced something truly unforgettable. This excursion does not include a guide. - Minimum age: 8 years. - Minimum height: 130 cm. - Minimum weight: 45 kg, Maximum Weight: 125 kg. - Pregnant women or people with heart, neck or back conditions are not allowed on the excursion. - We recommend wearing closed shoes. - This excursion is not recommended for guests who suffer from vertigo.